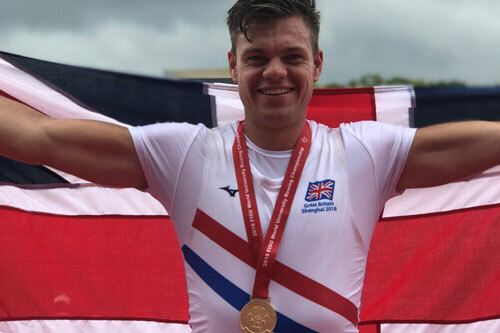 A student from The City Law School has won a gold medal for rowing with Team Great Britain in Shanghai. Rufus Scholefield, (GDL, Law), was part of Team GB Men’s Eight Team which took home the gold at the FISU World University Championship. This year saw 34 events take place at World University Championships, which is the only worldwide student sports tournament. Rufus and his Great Britain teammates competed against Holland, Italy, China and America before bettering Poland in the final by three seconds to secure the top prize. Rufus said: “It felt amazing to represent my country and we truly relished in the pressure of lining up in the final knowing it was our race to lose. “I was unable to compete two years ago after I picked up an injury during my preparations, so it meant a lot to be competing now. “City has been an enormous help to my rowing career. Studying Law at one of the UK’s top postgraduate law schools can be challenging – especially when you have to juggle essays and exams with training! “We were happy with the heat but knew we had more to give in the final as the other crews were really upping their game. We won in a time of 5:38 with Poland only three seconds behind us on 5:41.